Puerto Madryn is a tourist resort in the province of Chubut known all over the world for its natural parks which preserve marine species. Located at western coast of Golfo Nuevo, on the high coast of the Patagonic plateau, has a population of about 71.000. Its main industry is the ALUAR aluminum plant and there are also several fish processing plants. The main road connection is highway Nº 3 in a north-south direction and highway Nº 25 towards the west. It has no railway service and an airport 3km away provides daily connecting flights to Buenos Aires and other destinations. 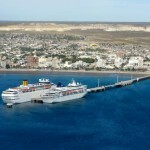 Puerto Madryn city is situated at the western end of Golfo Nuevo which is a deep water natural harbour. The principal trade is the import of alumina and the export of aluminum ingots, by-products, frozen fish, wool and flagstone, the relevant figures for 2011 being 726 vessels called, including mainly fishing vessels and gencargo, bulkers, reefer, full container and other. Total exports and imports amounted 1.578.000 ton, including aluminum-by products, frozen fish, wool, flagstone, frozen and dehydrated fruit. Movement of containers in 2011 was 27.775 TEUS. During the 2011/2012 season (from November to March), 21 vessels called with 20.190 passengers attracted by the important coastal wild life reserves in the area. 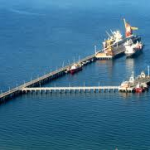 There are two piers at Puerto Madryn: the Almirante Storni pier and the Comandante Luis Piedra Buena pier. Berthing requests are granted in accordance with following priorities: Nº1 berth: Vessels with Alumina/Pitch for Aluar have absolute priority and berth must be vacated in their favor if in use. It not so required it can be used by other vessels. Vessels operating only with containers or cruise vessels have priority for berths 2 and 3 as well as Nº1 berth if not required by Aluar. If vessels are waiting in roads, those alongside are obliged to work overtime and may be ordered to vácate berth if tonnage rates as stipulated by port authority not achieved. Both piers, berthing operations can be hampered or suspended due to wind condition as per regulations. Suspensions vary for winds over 20-45 km/h depending on wind direction and whether vessel departing / taking berth on north or south side of piers. Vessels should anchor not less than 1,5 miles off the port where holding ground reportedly good. Entrance formalities can be completed at anchor if required. Pilot boards about one mile off both piers. Available at local Public Hospital or from a private clinic. Inter city bus services north to Bahía Blanca, Buenos Aires and south to Río Gallegos, Ushuaia via highway Nº 3, also regular bus service to Trelew. Airfield for small aircraft near town serves minor domestic flights. Daily air services from Trelew (distance 60 km) in same directions. Various categories available. Advisable book in advance during holiday season. Available by truck from Bah’a Blanca/Plaza Huincul. Allowance should be made for slow transfer of oil/possible delays. Three working days notice required. Available. 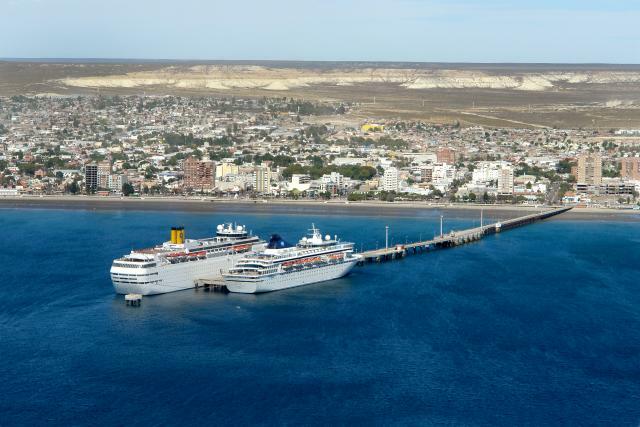 Puerto Madryn is a center for sub aquatic sports. Port Administration can arrange supply of 220 VAC, 380 VAC up to 80 KW on both piers depending on their own requirements. Portable generators can be hired. Fitted at all berths except western end of berth Nº 2. Several small firms offering services. Service provided by private companies. Minor repairs only, however, for electrical repairs usually reliable workshops/technicians available. Port Administration owns 1×45 ton SWL mobile crane, 1×50 ton SWL. Various forklift trucks owned by local stevedoring contractors are also available. Labor available given sufficien notice. 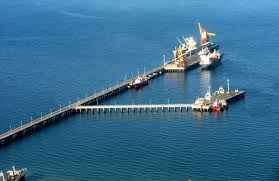 The Port Administration has 2 bonded warehouses of 1605 sqm covered area adjacent to the Almirante Storni pier, as well as storage container area of 27648000 sqm paved and 4600 sqm not paved, fitted with 244 reefer plugs plus 56 mobile pluds; additional of non-customs controlled storage space nearby (not paved). The port has a service of “Port Assistants” 24 hours a day for water/electricity connections, operational support, mooring lines and Operation controls. Also the port provides updated weather information (Golfo de San Jorge mouth).